Fashion Herald: Wonderwall: The Last Chance? 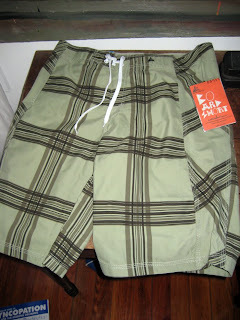 I even got another pair of board shorts for him - they were $3. 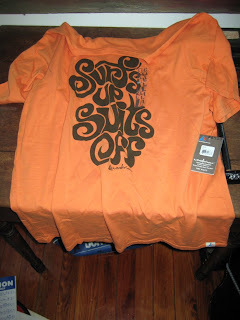 And I know West Coasters must find those surf T's kind of silly ($2), but everytime he wears one the young, Wmsbrg. hipster types go nuts. Kills me! Laird Hamilton, where are you and your wonderwall going? I will track you down, watch out Gabrielle. 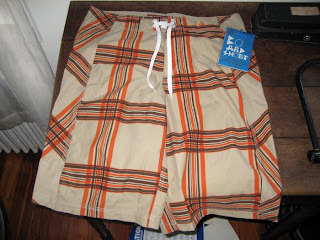 At least now the husband has enough board shorts & T-shirts to last him a lifetime. As for me, I didn't see much in the way of clothes, although I may go back for a spring Bitten tunic top. 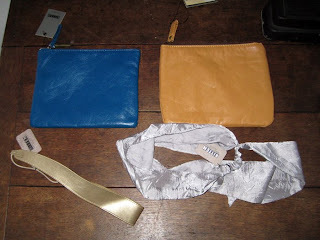 But I've had my eye on these Bitten wallet things for a while, so I picked up two of the brightest for under $3. And I couldn't resist the grey scarf hair thing, or the gold headband (Both around $1.50). Do not get the too-ridiculous-tight elastic hairbands(not shown) or you may do permanent brain damage. Or maybe it's just my ginormous head. I did buy the elastics, but for my cat who is obsessed and plays fetch with them for hours. are categorized as "Gym Active." I may have to go back for these (I bought the black) now that I know they are gym-appropriate. Brooklyn YMCA weightlifters, beware. 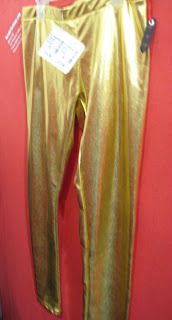 Hi there-yay for those gold leggings, you rock them!! If there's any way you can photograph yourself working out in the gold leggings ... that might make my year. We could do an exhibit of you and enc in shiny workout things! Sal - I was thinking perhaps a video, mostly of other's reactions! I can´t wait to go to NY! That will brighten up the gym, for sure. If I had gold leggings to work out in I think I'd work out every day (maybe... hehehe). OMG!!! you've got a pair of liturgical dance leggings...it's not possible! Oh, you KNOW those are gym-appropriate. You have to wear them. Yep, definitely gym appropriate. you will be a great eye candy for some muscle seeking guys!